It is significant that as early as 1907, when the first edition of the School Magazine, The Mooi, was produced, Old Boys of College were already being referred to as Old Moois, with the letters “OM” in brackets after their names. This term for an old boy of Potch College is taken from the Mooi River which flows through Potchefstroom. From the outset, the school showed a lively interest in the affairs and achievements of Old Moois and it was apparent that the interest was mutual. This was manifested in the establishment of the Potchefstroom College Old Boys‟ Society on 25 November 1911 at a meeting in Granton House, chaired by Charles Hope. A committee was formed with Mr Hope as the Chairman and they proceeded to draw up a constitution which was submitted to a general meeting of Old Moois on 8 April 1912, also in Granton House. It was amended and passed. Charles Hope, who had initiated the Old Boys‟ Society, remained its Chairman for eleven years, until 1922, when he was appointed its Patron. During the First World War years it appears that the Old Boys‟ Society suffered something of a setback, with little activity taking place, but it is recorded that in August 1920 Mr B.F. Woods “refounded” the Society and from then on it grew from strength to strength. Old Boys showed a continuing interest in the school that had formed them and equipped them so well for life. They helped provide facilities and they participated in school activities. The annual “Past vs Present” cricket match was a popular feature in the school sporting calendar from 1908 to 1942 and after the war it was revived and a rugby match against the Old Boys was also introduced. ted, large numbers of Old Moois joined the Armed Forces and fought for their country. The memorial tablets in the school hall tell the tragic tale of the many boys who laid down their lives in the First World War, Second World War and in subsequent conflicts. Although there was an unfortunate breakdown in the relationship between the school and the Old Boys‟ Society in the immediate post-Second World War years, this was not for long. The breach was healed with the appointment of Wally MacFarlane as Headmaster and during the subsequent half-century there has been a strong bond between the school and the Old Boys. During the wars in which South Africa has participated, large numbers of Old Moois joined the Armed Forces and fought for their country. The memorial tablets in the school hall tell the tragic tale of the many boys who laid down their lives in the First World War, Second World War and in subsequent conflicts. Although there was an unfortunate breakdown in the relationship between the school and the Old Boys‟ Society in the immediate post-Second World War years, this was not for long. The breach was healed with the appointment of Wally MacFarlane as Headmaster and during the subsequent half-century there has been a strong bond between the school and the Old Boys. During the summer of 1932-1933 the Old Boys‟ Cricket Club was founded in Johannesburg and played in the Transvaal League, Division II. The club existed until the late 1940s. A Potch Old Boys‟ Hockey Club was founded in 1962, also in Johannesburg, participating in the Southern Transvaal Hockey League. 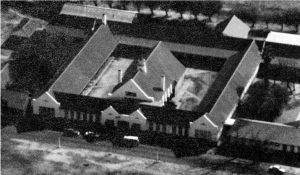 It initially utilised the fields behind the Doll‟s House in Louis Botha Avenue, but later acquired its own grounds and clubhouse in Northcliff. It was a very successful club, in its heyday fielding four men‟s and two ladies‟ teams, and existed well into the 1990s. In 1980 the Old Boys‟ Cricket Club was re-established, sharing facilities with the Hockey Club, and by 1985 there was also an Athletic Club for runners. An Old Boys‟ hockey “Old Men‟s Side” undertook a social tour to the UK in 1993. Old Boys‟ Golf Days have been a feature of the Old Boys‟ Calendar for many years, and besides the annual match that coincides with the dinner, there are often smaller, impromptu games organised amongst Old Moois around the country. But sadly, the sports clubs have disappeared. During the 1950s through to the 1980s the Old Boys‟ Society grew to the extent that it was generally acknowledged as the largest and strongest such society in the country – some said in the entire southern hemisphere. The annual Old Boys‟ Dinner held at the Wanderers Club in Johannesburg was attended by some 500 boys and there were dinners held in Cape Town, in Durban and in other centres. A newsletter, known as The Old Mooi, was sent out twice a year to all Old Boys who were members of the Society. Terry Collins, Secretary of the Old Boys‟ Society for 27 years, was a powerful force behind this revival, growth and sustaining of a vibrant organisation for men who were proud to be products of Potch Boys‟ High. In an age before electronic media were generally available, he was a communicator par excellence, prolific in his compiling and distributing interesting newsletters that were voraciously consumed by the eager Old Boys. Today, communication is by e-mail. Many Old Boys have maintained a lasting interest in the school, appreciating what a vital role it played in forming and preparing them for later life. During College‟s Centenary year in 2005 and anonymous Old Boy sponsored a tour to the UK by the Head Boys of the four Houses, accompanied by the Vice-Principal, Chris Dutton (OM). They visited London, Cambridge and Oxford, Twickenham Stadium and some British schools. They also attended a memorable Centenary Dinner with Old Moois living in the UK. The Old Boys‟ Society has, over the years, contributed towards the maintenance and addition of facilities at the school, as already described under “The College Campus”. In an effort to help on the academic side, donations from the Old Boys‟ Society have enabled boys to attend extra classes organised by The Star to better prepare them for their matric exams. In an effort to reinvent itself as an organisation both relevant and attractive to the young men of today, an effort is being made to acquaint the boys at school with the aims and objectives of the Society and to instil in them a continuing pride in their alma mater. At the same time, it was felt that the Society needed to involve itself more directly in identifying and providing for certain needs of the boys. As a result, the Inkazimulo – Shining Light Trust was established. A parent/pupil trust fund is administered by the Inkazimulo Trust and receives a small levy from parents on their annual fees to the school. The Old Boys‟ Society is dedicated to support of the school in whatever way possible and continues to strive towards this end.